Who needs AB when you have ZJ. Never in a million years would I trade a 1st or 2nd round pick for an extremely highly paid diva WR who is getting close to 30 y.o. Trying to draft a WR is real hit and miss, especially trying to fill the #1 and a WR of AB's caliber becoming available is rare IMO. Albeit 30 is catching AB at the tail end of his prime. Myself personally, I'm going to ask myself will the 1st round player I draft have as much impact on the team / success as AB. LOL. This is the kinda chump you guys want on your team? Thank god you guys aren't running this team. he's a quitter...….the worst possible kind of teammate. It'd be an admission by McBeane that they can't draft... Why bring in locker-room napalm in a WR draft this rich? Lol. Can’t believe some of u people wanted Brown on this team. Throwing his ex teammates under the bus. Imagine what he would’ve done to Allen if he couldn’t get the ball to him? Just like I said this would’ve been a train wreck for a young QB like Allen. Go blame Tomlin for Brown's tweets at JuJu. AB showing his true colors that I saw a MILE away. I knew the kinda person he was. Some people just can't see things for what they are. LOL. It's almost as stupid as someone openly anointing Tyrod Taylor as our franchise QB back in January of 2016! But who would've been silly enough to do that? OK. I love delusional people. Where was I wrong? 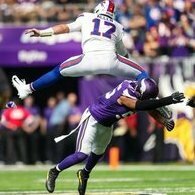 He was the first Bills QB to bring us to the playoffs since when? How'd the Bills do when we yanked him out and put in Peterman? And sadly enough, Tyrod did show more promise than any QB since Kelly. That just shows how piss poor our QB situation was than anything else. You rubber stamped him a franchise QB. Wrong. Plain and simple. And no, I didn't have to go back through your posts--you may learn over time that brazen declarations are noteworthy to those of us with decent memories...it was actually quite a quick and painless exercise to both recall and locate the offending post. So let me get this straight...you are running around to everyone in some sort of “I told you so” or “I’m right about everything” parade about something that neither has been proven right or wrong, nor really can be at least for a long time? Not to mention, just about everyone had some level of concern about AB fitting in. Your string of recent posts to people is beyond dumb. First, you have NO IDEA if AB will be a good teammate to the Raiders. You’re running around like you’re some kind of proven right prophet when everyone, including me, had concerns about how AB would be with a new team. Yet you act like he’s suddenly proven he’s a bad teammate (and talk delusionally like you’re the only one who had some concerns about that, which you weren’t) all because he still isn’t getting along with his OLD team? And you're the one going through old posts...But after attacking @thebandit27 and him bringing up other things you said, you now tell Bandit to get a life for revisiting old posts??? LMFAO, now that’s some priceless s*** right there. Wake us up when you have something actually worth reading to say, or factual. So why we still still talking about AB?